The Hershberg Diet was created by Melissa Hershberg, MD, a practitioner of preventative medicine at The Toronto Clinic, an integrative health care facility, where she counsels some of Canada’s most renowned leaders. Hershberg says that her program is not another fad diet but is a weight loss system based on hard science concerning macronutrients and thermogentics. She created her diet to help people to lose weight quickly as well as being easily be able to maintain their weight for life. Hershberg claims that you will notice the results after just one week on her plan. Hershberg says that most people, including health professionals, only recognize three macronutrients – protein, carbohydrates and fat. Her identification of a fourth macronutrient changes the way we look at food and eating as well as how we interpret nutrition labels, she says. According to Hershberg by eating foods high in the fourth macronutrient dieters can eat as much as they like and still lose weight without experiencing hunger or deprivation. She explains how you can determine the foods that are highest in the fourth macronutrient so that you can lose weight quickly and easily. The diet includes four phases with the first being the most restrictive because Hershberg wanted dieters to be able to see fast results. This phase of the diet is moderately low in carbohydrates and emphasizes lean proteins and non-starchy vegetables, but high in the fourth macronutrient. In the remaining phases dieters are permitted to eat small portions of carbohydrate foods such as oatmeal, whole grain pasta, whole-wheat bread and granola bars, which are progressively introduced and allowed in limited amounts. The fourth stage is the maintenance phase where dieters learn how to follow and eating plan that supports their goal of maintaining an ideal weight. Dieters are also introduced to the concept of “hotty foods”, which elevate the metabolism and gently stimulate fat burning hormones without negatively affecting blood sugar and insulin levels. These are called thermogenic foods and their influence on metabolism has been scientifically validated. Throughout the book Hershberg provides dieters with tips to help design a personal strategy for losing weight. The book also includes sample meals plans for each phase and a selection of recipes that are high in the fourth macronutrient. Fruit, vegetables, fat-free cottage cheese, egg whites, yogurt, tuna, salmon, chicken, turkey, ham, steak, lamb, oatmeal, whole-wheat pasta, sunflower seeds, almonds, pine nuts, hummus, olive oil, flaxseed oil, light salad dressing, Splenda, green tea. The following is a sample meal plan for phase one. This book does not include exercise recommendations but focuses on a macronutrient diet and thermogenic foods. 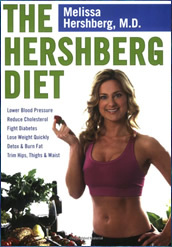 The Hershberg Diet: Discover How the Fourth Macronutrient Can Help You Shed Pounds and Beat the Metabolic Syndrome retails at $19.95. Encourages a high intake of fourth macronutrient fresh fruit and vegetables. Includes recipes, meal plans and shopping lists. Thermogenic foods can help to increase metabolism. Requires elimination of certain foods, especially in the initial stages. Some phases of the diet require measuring food portions. The Hershberg Diet is a lifestyle approach to weight loss that will also allow dieters to experience noticeable results very quickly. It involves emphasizing foods that are high in what Hershberg has identified as the fourth macronutrient as well as thermogenic foods that increase metabolism.